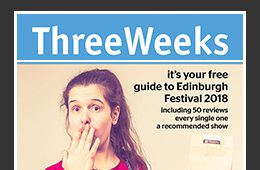 Ahead of each Edinburgh Festival, ThreeWeeks co-Editor Caro Moses recommends shows to see in handy sets of three. Then, once the Festival is under way, we tip Three To See each day based on our reviews. All year round, we tip Three To See in London every day on ThisWeek London – check out this week’s tips here.